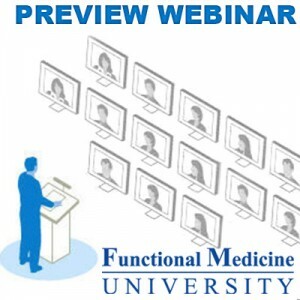 This Monday (October 5, 2009) at 6pm PST 9 PM EST the Functional Medicine University will be holding a preview webinar of it’s online university which specilizes in training physicians and practitioners in the field of Functional Diagnostic Medicine. The online training in Functional Medicine offers 24×7 online access to an extensive archive of learning materials. The webinar will be hosted live and will give you an inside glimpse of how the online university functions and what you as a student of FMU can expect. If you have never taken an online training before this is a great opportunity to get involved and learn Functional Medicine. The online learning center at Functional Medicine University, allows for you to learn at your own pace and without incurring the costs of travel and accommodations, such as with a traditional conference or seminar. The upcoming tour will include a review of all aspects of the University, including the online training forums and downloads library. There will also be a review of the indepth nine modules which comprise the Functional Medicine online training. Previous students will also be given an opportunity to share some of their experiences of how they found the training and what they recommend when getting involved in learning Functional Medicine. If you need more information please visit: http://www.FunctionalMedicineTraining.com or click on the link above. We look forward to seeing you at the upcoming webinar.